Today Sweet Briar College announced new-student enrollment numbers and details of its incoming first-year class for the 2018-19 academic year. A total of 129 new students have enrolled for the fall 2018 semester, compared to 91 last fall. The Class of 2022 will be comprised of 114 first-year students (compared to 79 last fall) representing 23 states, with half of the students from Virginia, and five non-USA countries — China, Ethiopia, India, Mexico and Russia. The class’s mean grade point average is 3.51 (compared to 3.34 last fall) and mean SAT (combined) is 1098 (compared to 1071 last fall), with 44 students earning the Presidential Scholarship, the College’s merit award for the highest academic achieving students. 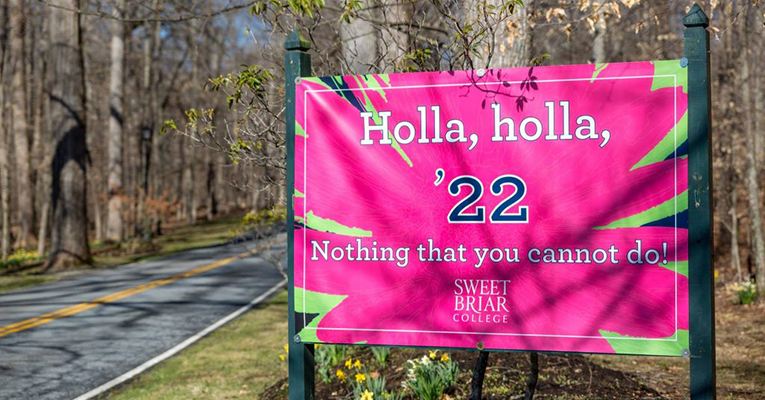 “As acknowledged around the country, Sweet Briar is a new academic model for liberal arts institutions in the 21st century. This increase in enrollment is a strong indicator that the forward-thinking changes introduced last year are exactly what today’s student seeks to prepare her to be tomorrow’s leader,” said Melissa Farmer Richards, vice president for communications and enrollment management. Fifteen of the 129 new students are transfer students representing the states of Virginia, Missouri and New York, as well as the countries of Mongolia and India. With Sweet Briar’s rolling admission, new students are continuing to apply for the upcoming academic year, and the College has some spots remaining. Interested applicants should apply right away and contact the Office of Admissions to expedite the application process. Visit sbc.edu/admissions/apply-now or call 434-381-6142.